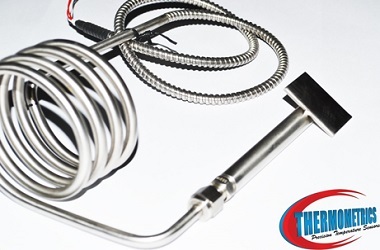 The Thermocouple is a junction of two material used to convert heat into electrical energy.When a pair of wires made up ofdifferent metals is joined at one end and a temperature difference produce a voltage proportional to the voltage. How the output voltage is measured the thermocouple? The skin effect is refers to the condition where at high frequency the current is forced to pass through outer surface of conductors as inductance & reactance of inner part is larger than that of outer part. What are advantages of themocouple? It is cheaper and has good reproducibility. A Resistance Temperature Detector (RTD) is a device with a significant temperature coefficient (that is, its resistance varies with temperature). It is used as a temperature measurement device, usually by passing a low-level current through it and measuring the voltage drop. A thermistor is a common type of RTD. What are two types of thermistor? Thermistors can be classified into two types, depending on the sign of k. If k is positive, the resistance increases with increasing temperature, and the device is called a positive temperature coefficient (PTC) thermistor, or posistor. If k is negative, the resistance decreases with increasing temperature, and the device is called a negative temperature coefficient (NTC) thermistor. LVDT is abbreviation of linear variable differential transformer. it is a transducer which converts voltage into displacement. The conversion of electrical pulses to mechanical vibrations and the conversion of returned mechanical vibrations back into electrical energy is the basis for ultrasonic testing. The active element is the heart of the transducer as it converts the electrical energy to acoustic energy, and vice versa.The active element is basically a piece of polarized material (i.e. some parts of the molecule are positively charged, while other parts of the molecule are negatively charged) with electrodes attached to two of its opposite faces. The toothed rotor consists of a metallic toothed rotor mounted on shaft whose speed is to measured .A magnetic pick up is placed near toothed rotor. It is used for measurement of angular speed. What are the materials used for thermocouple? The elements used are:Constantan, alloy of Nickel (Ni) – Copper (Cu) Chromel, alloy of Nickel (Ni) alloy of Nickel (Ni) and Aluminum (Al) Magnesium (Mg), base element Platinum (Pt), base element . The basis of thermocouples was established by Thomas Johann Seebeck in 1821. Explain temperature measurement using thermocouple? The basis of thermocouples was established by Thomas Johann Seebeck in 1821 when he discovered that a conductor generates a voltage when it is subjected to a temperature gradient.Measuring this voltage requires the use of a second conductor material that generates a different voltage under the same temperature gradient. If the same material is used for the measurement, the voltage generated by the measuring conductor simply cancels that of the first conductor. The voltage difference generated by the two dissimilar materials can be measured and related to the corresponding temperature gradient.Based on Seebeck’s principle, it is clear that thermocouples can only measure temperature differences and they need a known reference temperature to yield the absolute readings.The Seebeck effect describes the voltage or electromotive force (EMF) induced by the temperature gradient along the wire.The change in material EMF with respect to a change in temperature is called the Seebeck coefficient or thermoelectric sensitivity. This coefficient is usually a nonlinear function of temperature. What are errors in this instrument? CJC errors represent the difference between the actual temperature at the point where the thermocouple is connected to the measurement device (the cold-junction temperature), and the measured temperature by the device.The CJC error is roughly a 1 to 1 contributor to the accuracy of the temperature measurement of the thermocouple, and is often one of the largest single contributors to the overall accuracy.The overall CJC error includes the error from the CJC temperature sensor (often a thermistor) used to sense the cold-junction temperature, the error from the device measuring the CJC sensor, and the temperature gradient between the cold-junction and the CJC sensor. Of these three errors, the temperature gradient between the cold-junction and the CJC sensor is generally the largest, and typically has the largest variation. The error from the CJC sensor can be a large contributor in many devices; however, high-accuracy thermistors or resistance temperature detectors (RTDs) with small errors are common in many high-end thermocouple measurement devices. What are major material used for RTD? What is resistance temperature coefficient ? Explain method of measurement of temperature? 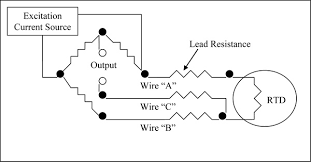 The method for calculating the resistance of an RTD is to place the device in a Wheatstone bridge that is excited by a known voltage.A Wheatstone bridge consists of four individual resistors. If the RTD is the only unknown resistance in the bridge, the voltage measured from the bridge, the excitation voltage, and the values of the three other resistors is used to determine the resistance of the RTD.This Wheatstone bridge configuration is known as a quarter-bridge configuration because the RTD is the only variable resistance and the resistances of the other three resistors is constant. What are features of RTD? A7 RTDs are popular because of their excellent stability, and exhibit the most linear signal with respect to temperature of any electronic temperature sensor.They are generally more expensive than alternatives, however, because of the careful construction and use of platinum.RTDs are also characterized by a slow response time and low sensitivity; and because they require current excitation, they can be prone to self-heating. What are effect of temperature on RTD? RTDs are popular because of their excellent stability, and exhibit the most linear signal with respect to temperature of any electronic temperature sensor. What are the materials used for construction of Thermisters? Sintered mixture of metallic oxide such as mangnese, nickel, cobalt, iron & uranium. What are the feature of thermistor? Thermistors (thermally sensitive resistors) are similar to RTDs in that they are electrical resistors whose resistance changes with temperature.Thermistors are manufactured from metal oxide semiconductor material which is encapsulated in a glass or epoxy bead.Thermistors have a very high sensitivity, making them extremely responsive to changes in temperature. For example, a 2252 Ω thermistor has a sensitivity of -100 Ω/°C at room temperature. In comparison, a 100 Ω RTD has a sensitivity of 0.4 Ω/°C. Thermistors also have a low thermal mass that results in fast response times,but are limited by a small temperature range. Thermistors have either a negative temperature coefficient (NTC) or a positive temperature coefficient (PTC).The first has a resistance which decreases with increasing temperature and the latter exhibits increased resistance with increasing temperature. What is the temperature range for thermistor? The temperature range is -90C to 130C. Define self heating property of thermistor? When a current flows through a thermistor, it will generate heat which will raise the temperature of the thermistor above that of its environment.If the thermistor is being used to measure the temperature of the environment, this electrical heating may introduce a significant error if a correction is not made.Alternatively, this effect itself can be exploited. It can, for example, make a sensitive air-flow device employed in a sailplane rate-of-climb instrument, the electronic variometer, or serve as a timer for a relay as was formerly done in telephone exchanges. The electrical power input to the thermistor is just: where I is current and V is the voltage drop across the thermistor. This power is converted to heat, and this heat energy is transferred to the surrounding environment. List the applications of themistor? PTC thermistors are used as timers in the degaussing coil circuit of CRT displays and televisions. When the unit is initially switched on, current flows through the thermistor and degauss coil. The coil and thermistor are intentionally sized so that the current flow will heat the thermistor to the point that the degauss coil shuts off in under a second. NTC thermistors are used as resistance thermometers in low-temperature measurements of the order of 10 K.
NTC thermistors can be used as inrush-current limiting devices in power supply circuits. They present a higher resistance initially which prevents large currents from flowing at turn-on, and then heat up and become much lower resistance to allow higher current flow during normal operation. These thermistors are usually much larger than measuring type thermistors, and are purposely designed for this application. What is the frequency range of ac applied to the primary winding? The frequency of ac applied to primary window may be between 50hz to 20khz. What is the null condition in the LVDT? When the core id at its normal(null) position, the flux linking the both secondary Windings are equal & hence equal emfs are induced in them.Thus at null position Es1=Es2. the output voltage E0 is zero at null position. What are the advantages of LVDT? What are the disadvantages of LVDT ? Very high displacement is required for generating voltage. Shielding is required for magnetic fields. It is affected by the vibrations. It is affected by temperature changes. What is the value of excitation voltage? The value of excitation voltage is 5v to 12v. What are the uses of LVDT? LVDT can be used in all application where displacement ranging from a Fraction of mm to few cm to be measured.It can be used as a device to measure force, weight, & pressure etc. When an AC excitation signal is applied to the Primary Coil (P), voltages are induced in the two Secondary Coils (S).The Magnetic Core inside the Coil Winding Assembly provides the magnetic flux path linking the Primary and secondary Coils. Since the two voltages are of opposite polarity, the Secondary Coils are connected series opposing in the center, or Null Position.The output voltages are equal and opposite in polarity and, therefore, the output voltage is zero. The Null Position of an LVDT is extremely stable and repeatable. 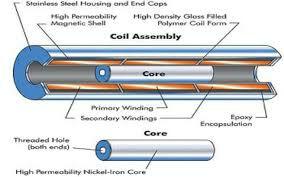 When the Magnetic Core is displaced from the Null Position, an electromagnetic imbalance occurs. This imbalance generates a differential AC output voltage across the Secondary Coils which is linearly proportional to the direction and magnitude of the displacement.When the Magnetic Core is moved from the Null Position, the induced voltage in the Secondary Coil, toward which the Core is moved, increases while the induced voltage in the opposite Secondary Coil decreases. LVDTs possess the inherent ruggedness and durability of a transformer and truly provide infinite resolution in all types of environments. As a result of the superior reliability and accuracy of LVDTs, they are the ideal choice for motion control. Can you define strain gauge? It a metal conductor is stretched or compressed, its resistance change on Account of the fact that both length & diameter of conductor change.The Strain gauges are used for measurement of strain lay change in resistance. What is types of strain gauges ? The different types are grid type,rosette type,torque type and helical type. What are the materials used for strain guage? Explain the principle of operation? strain gauge takes advantage of the physical property of electrical conductance and its dependence on not merely the electrical conductivity of a conductor, which is a property of its material, but also the conductor’s geometry.When an electrical conductor is stretched within the limits of its elasticity such that it does not break or permanently deform, it will become narrower and longer, changes that increase its electrical resistance end-to-end. 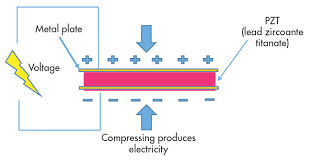 Conversely, when a conductor is compressed such that it does not buckle, it will broaden and shorten, changes that decrease its electrical resistance end-to-end. From the measured electrical resistance of the strain gauge, the amount of applied stress may be inferred. A typical strain gauge arranges a long, thin conductive strip in a zig-zag pattern of parallel lines such that a small amount of stress in the direction of the orientation of the parallel lines results in a multiplicatively larger strain over the effective length of the conductor—and hence a multiplicatively larger change in resistance than would be observed with a single straight-line conductive wire. Explain the effect of temperature on strain Gauge ? Variations in temperature will cause a multitude of effects. The object will change in size by thermal expansion, which will be detected as a strain by the gauge. Resistance of the gauge will change, and resistance of the connecting wires will change.Most strain gauges are made from a constantan alloy Various constantan alloys and Karma alloys have been designed so that the temperature effects on the resistance of the strain gauge itself cancel out the resistance change of the gauge due to the thermal expansion of the object under test.Because different materials have different amounts of thermal expansion, self-temperature compensation (STC) requires selecting a particular alloy matched to the material of the object under test. What are the errors in strain guage? Zero Offset – If the impedance of the four gauge arms are not exactly the same after bonding the gage to the force collector, there will be a zero offset which can be compensated by introducing a parallel resistor to one or more of the gage arms. Temperature coefficient of Gage Factor (TCGF) – This is the change of sensitivity of the device to strain with change in temperature. This is generally compensated for by the introduction of a fixed resistance in the input leg, whereby the effective supplied voltage will increase with temperature, compensating for the decrease in sensitivity with temperature. Zero Shift with temperature – If the TCGF of each gage is not the same, there will be a zero shift with temperature. This is also caused by anomalies in the force collector. This is usually compensated for with one or more resistors strategically placed in the compensation network. Linearity – This is an error whereby the sensitivity changes across the pressure range. This is commonly a function of the force collection thickness selection for the intended pressure and/or the quality of the bonding. Hysteresis – This is an error of return to zero after pressure excursion. Repeatability – This error is sometimes tied-in with hysteresis but is across the pressure range. Define guage factor for strain guage ? The ratio of change in value of resistance to change in value of length with respect to their original resistance and length is called guage factor. Define hysteresis of strain gauge ? If resistance of strain guage is measured with no strain applied and guage is then stressed to its maximum usable resistance value, the measured resistance after stress is removed differes from original value.The inability to guage element to resume exact physical form it had before being elongated.This effect is called hysteresis. What is the instrument used for measurement of speed. Name the instrument user to measure angular velocity? List the advantages of DC tachometer generator? The output voltage is typically 10m v/rpm & can be measured with conventional type dc voltmeter. List the disadvantage of AC tachometer generator? The difficulty with is this s/m is low speed the frequency of o/p voltage is low, & There are ripples in o/p voltage waves hopes. With high speed frequency increase, impedance of coils of tacho generator increases. What is the function of resistance in dc tachometer generator? It is used for purpose of limiting the current from generator. Specify the temperature range for operation of AC tachometer generator? Tachometer Generators are designed for continuous operation in ambient temperatures ranging from -55°C to +100°C(-67°F to +212°F). Voltage output at 25°C will not deviate by more than 0.01% per degree of change within the range of -20°C to +75°C. 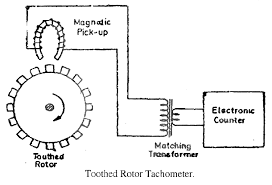 Tachometers are used to measure the velocity of a rotating object. They operate on the principle that a driven motor (i.e., a motor operated as a generator) produces a voltage that is proportional to the angular velocity of the motor.